Last week VMware released the long awaited VSAN including the even more popular licensing information. Today I would like to discuss what I see as one of the points that I have yet seen to be discussed regarding VSAN – and in my eyes the most problematic. An unspoken truth is something in life we all know to be true but to speak it is taboo. Before I go in what this unspoken truth is of which I am talking about, I would like to congratulate the VSAN team on a job well done!! VSAN is something we have been waiting for – for a long time – and I voiced my comments before on the launch and its lack of licensing info – but that is now water under the bridge. VSAN is a scale out storage solution – up to 32 nodes – which is a great thing. 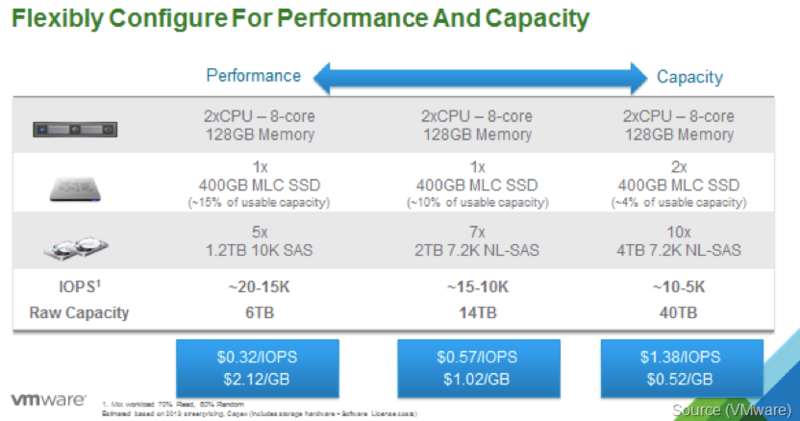 I am not going to go into the whole debate of - “Is this cheaper/better/faster/more reliable than a traditional SAN/All Flash Array?” – there are others who have already started to prepare VSAN calculators, price comparisons etc..
VSAN is about flexibility – going from a configuration catered to high performance all the way to that catered to the needs of large storage capacity. Here are the current VSAN Ready nodes (as of today’s date) on the VMware HCL. VSAN is not suitable for deployment on Blade servers. We have now come to the conclusion that the flexibility is there – but just not for blades – which to me means, that if I would like to deploy a VSAN cluster – it will have to be on rack mounts. What are the implications of such a decision? Larger Datacenter footprint. That means more power cables, more electricity, more cooling. Converged networking – is possible – but will usually require a minimum of 3 (perhaps 5) network cables per server. Central Hardware management – is going to be very difficult – compared to the Blade Chassis management provided by vendors today. This is actually the complete opposite of what the current industry trends – most companies have found the benefits of blades are highly beneficial to their environment – and this is the exact opposite direction. Change of current methodology and work practices – if today you are using blades – then you will have to move your virtualization workloads over to rack mounts. You have an established vSphere Infrastructure – all running on UCS/HP/Dell/IBM blades. To move over to VSAN – you will need to decide what workloads will be migrated to this new cluster – because VSAN is not (in its current version) accessible outside of the VSAN cluster. You will need to purchase new hardware for such a cluster – different to your standard deployment. To accommodate VSAN – it is recommended to have a dedicated 10Gb (actually 2 of them – for redundancy) for the VSAN traffic – that is above and beyond what you will need for each host for Mgmt, vMotion, OOB (iLO/IMM) and VM networking. that is a whole lot of ports that you will need. Just to clarify once more – I am not saying that VSAN is not a good solution, it could very well be the perfect solution for the right use case. But it is not the be and and end all solution to all of your storage problems. Do the math. For some of you it will be more than worthwhile – but for others, not so. One more comment before I sign off. I do see this as the second part in the direction that VMware is moving towards making the Virtualization Admin the “king of the castle” and the SDDC. Deploy NSX – and you now have full control of your network – relying on the Network Admin is a thing of the past. Deploy VSAN – and you now have full control of your storage – no need to ask for LUNS or storage space from the Storage group. Duncan Epping - VSAN – The spoken reality. (Flattery will get you everywhere guys…). That was the purpose – to make people think, voice their opinion and their thoughts.